What is the concrete polishing process? The process of polishing concrete is similar to the process of sanding wood. We use heavy-duty polishing machines equipped with progressively finer grits of diamond-impregnated disks to gradually grind down the concrete surface. Because it is a multi-stage process, we can achieve the degree of smoothness and shine that you desire. Is the process dusty or messy? No, it’s not. We use state-of-the-art equipment that makes the process almost entirely dust-free. In general, any concrete floor that is structurally sound can be polished, as long as it is free of extensive patching or waviness, and is at least reasonably non-porous. How long will polished concrete last? This is a permanent process. The degree of shine on your polished concrete floor is from the multi-stage grinding, not from any wax, acrylic, or other “shiny coatings” that will eventually fail. In heavy industrial, commercial, or institutional use, an inexpensive re-polish may be needed years down the road depending on the individual application’s maintenance. How durable is polished concrete? 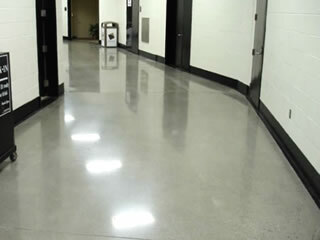 With proper care and a good maintenance program, polished concrete floors will have a very long useful life. 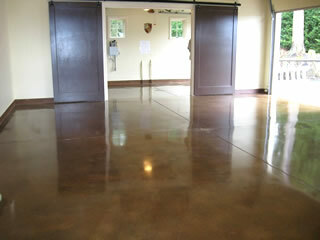 How do you maintain polished concrete floors? 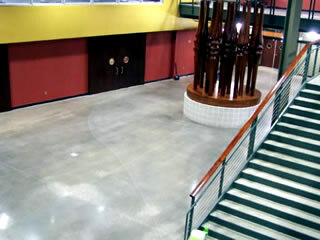 Compared to other flooring types, polished concrete is virtually maintenance-free. Regular damp-mopping to remove abrasive materials (like sand and dirt) from the surface will help prevent scratching and will help maintain the surface gloss. Actually, clean and dry polished concrete floors are even less slippery than plain concrete surfaces. For facilities requiring extra protection against slip-and-fall accidents, polished concrete floors can be treated with anti-slip conditioners during routine cleaning. The price of polished concrete flooring varies depending on the size of the area, the condition of the slab, the level of grinding required, the aggregate exposure desired, and the final finishing sealer. Compared to wood, tile, vinyl, or carpet, polished concrete is a cost-effective alternative. For your free consultation and estimate, call 717-375-5600 today. For your free consultation and estimate, call us at 717-375-5600 today.